The first half of the ’70s was very good for classic rockers Grand Funk Railroad. From the release of the band’s 1969 debut LP On Time, Grand Funk (as they’d later become known) enjoyed a string of Top Ten Gold™ and Platinum™ selling albums that peaked with what many would consider the pinnacle of their creative and commercial success, 1973’s We’re An American Band. Working with producer and musician Todd Rundgren, the band scored a chart topping hit with the title track, the album peaking at #2 on the charts and quickly selling better than a million copies. On January 27, 2017 this oft-overlooked underdog of the Grand Funk catalog will be reissued by Marshall Blonstein’s Audio Fidelity label as a limited edition hybrid SACD. The enhanced Super Audio CD sound brings the best of the band to forefront of each song. The original vinyl album was packaged in a trippy psych-drenched 3-D sleeve with a pair of 3-D glasses embedded in the album front cover. 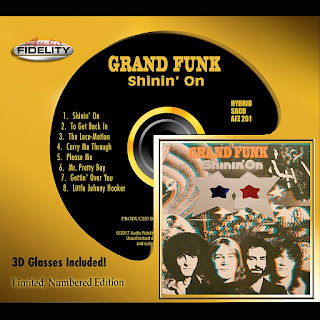 The Audio Fidelity reissue reproduces the original 3-D sleeve and also includes a pair of 3-D glasses so that the listener can enjoy the songs and album artwork as originally intended.